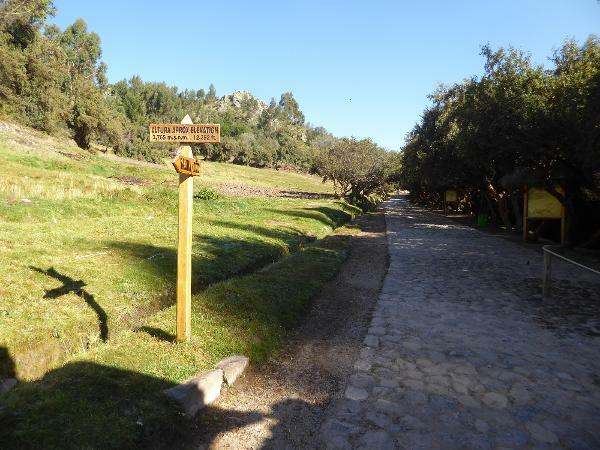 This folder contains pictures of Tambomachay, Tipón, and Moray. The unifying element in these images is water, in particular the engineering of water in the hands of people who delight in seeing it trickle and pour and dribble and soak. The theme is engineering elevated into an art form. 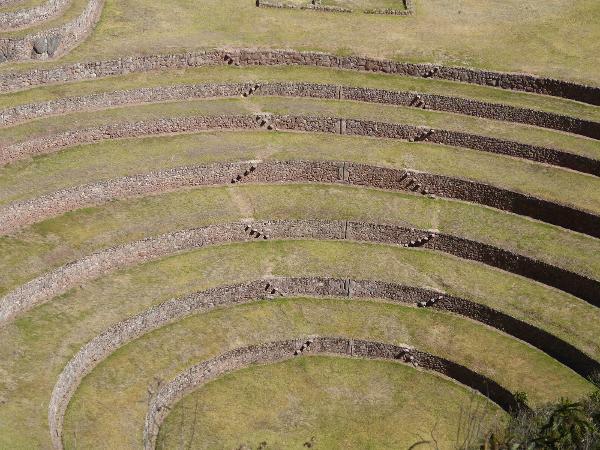 We've parked about five miles from the Cusco cathedral. It's early: big shadows, small crowds. By now we're used to these walls. Does make you wonder how many fingers got crushed, how many legs broken. Tourist trinkets haven't been unpacked yet. 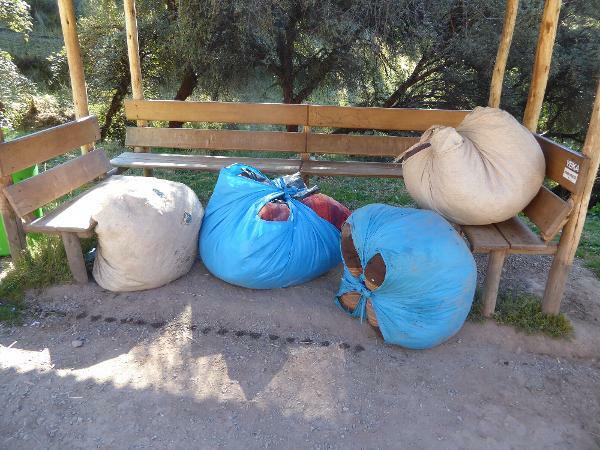 You should see teenage girls carrying these packs. So much for American beauties doing their exercise routines. Here we are. Nobody can tell you much about this place, and it's certainly been restored a bit. (See the photo in Hiram Bingham's article in the The National Geographic for April, 1913.) You can see the wet spots, fed by water from that hole in the mountain at the upper left. 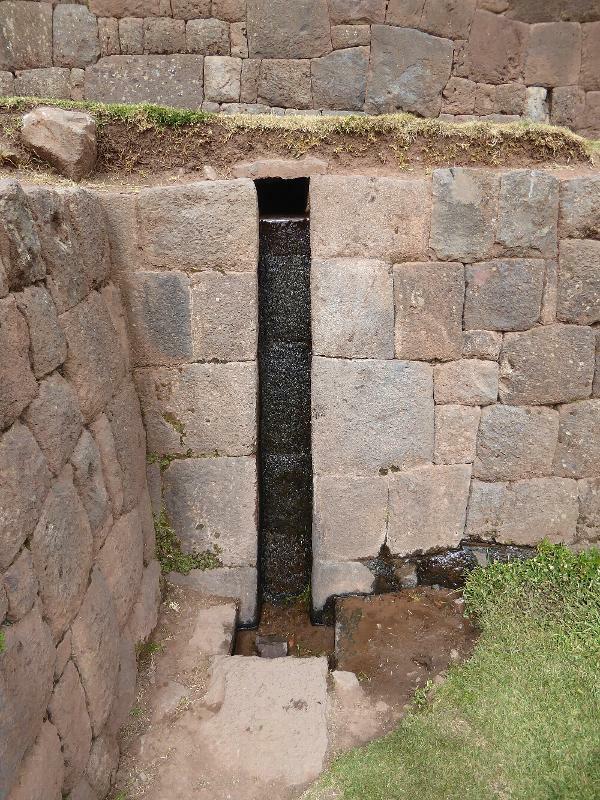 Trouble is, there's not enough mountain to feed a spring with this much flow, so there's apparently a tunnel or siphon bringing water from an unknown source. Which raises the question, why go to so much work? You can ask the same question about the stonework, too. Frustrating that you won't get answers. The one-spout, two-spout pattern will be seen later in this folder. 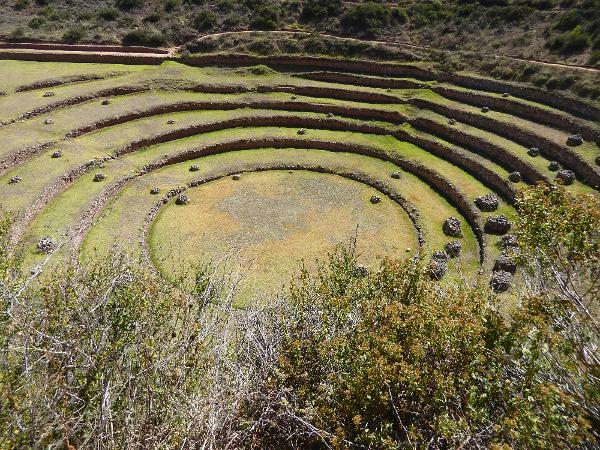 Now we're 20 miles south of Cusco and about a mile and a half up in the hills east of the village of Tipón. 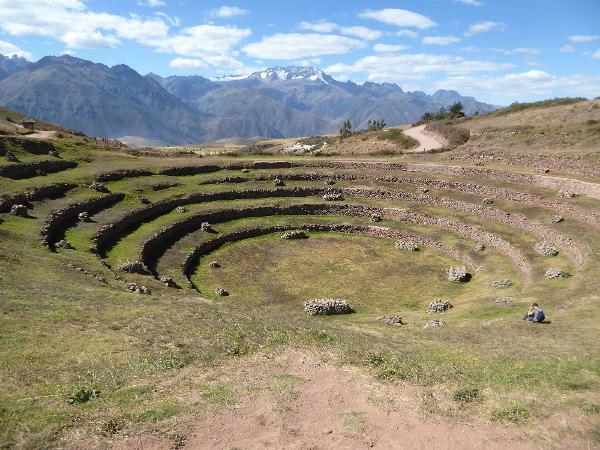 The 1,300-foot-long flight of terraces--the andenes principal or main platforms--presumably had a name once upon a time, but it's unknown and so the terraces are known by the name of the village down on the valley floor. 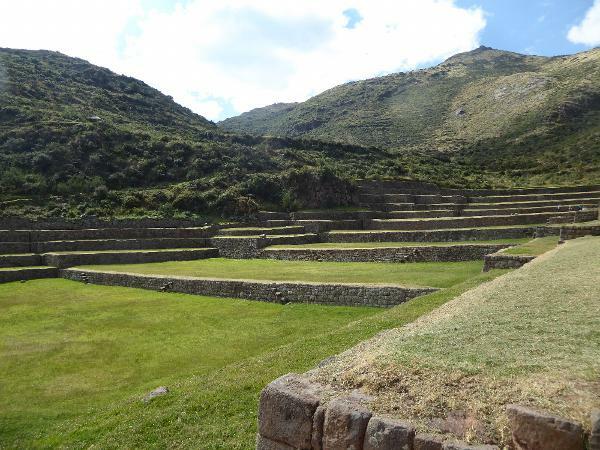 The largest of the terraces, the square one in the middle distance, measures 1.1 acres. 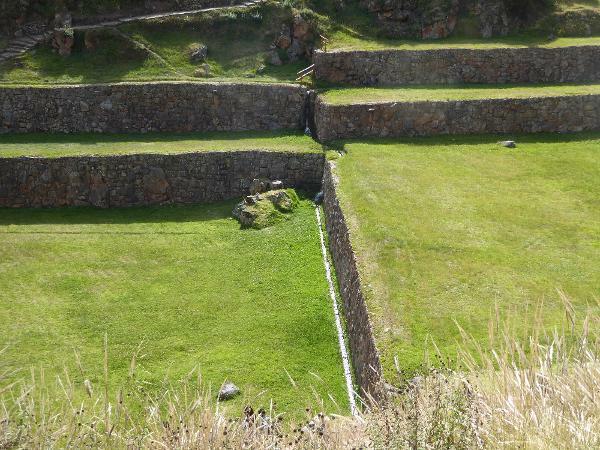 Building it and its neighbors required earth to fill what had been a ravine. The source was what is now the flat area seen here on the right. Here's the view looking up from the other side. I'm particularly drawn to the flying or floating stairs that protrude from the walls. The stone is andesite. 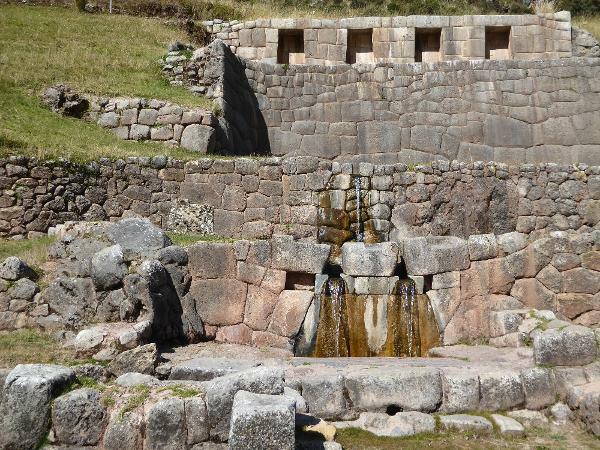 Top of the set: it's the ceremonial fountain consolidating the waters of eight conduits. 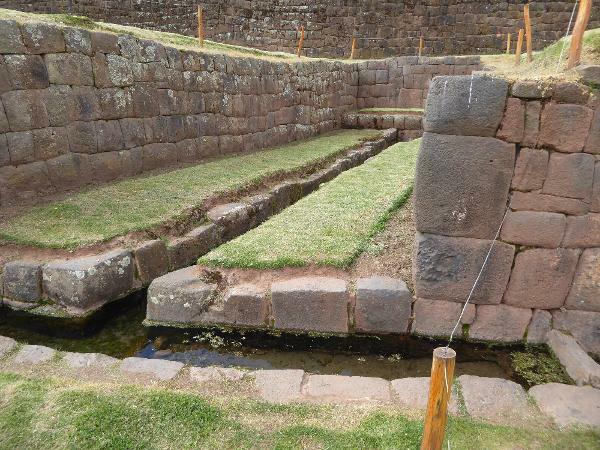 The water flows into this set of pools. 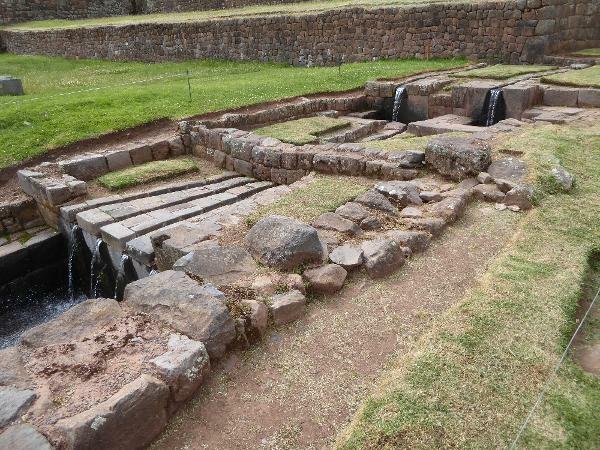 The terraces also get (or at least once got) supplemental water from a canal bringing water from the Rio Pukara, in the valley to the immediate north. 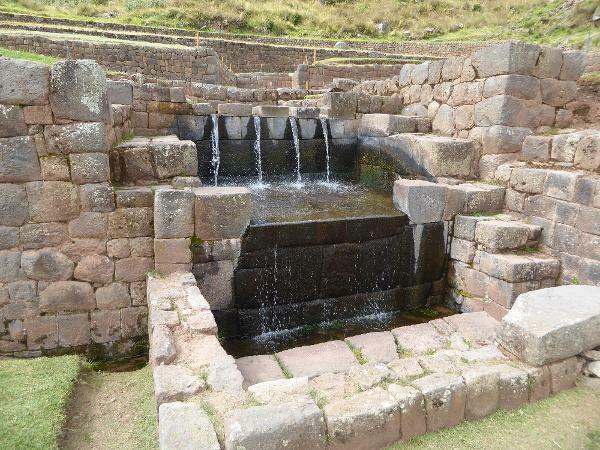 For a full-length study of the hydraulics, see Kenneth R. Wright, Tipon: Water Engineering Masterpiece of the Inca Empire, published by the American Society of Civil Engineers, 2006. 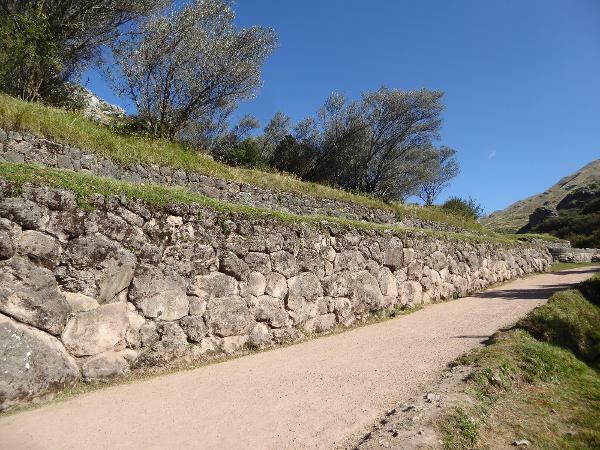 Wright, by the way, refers to the masonry at Tipón as "stonework poetry" (p. 13). So we go from one jet to two to four. Still waters don't always run deep. We'll chase the water downhill. 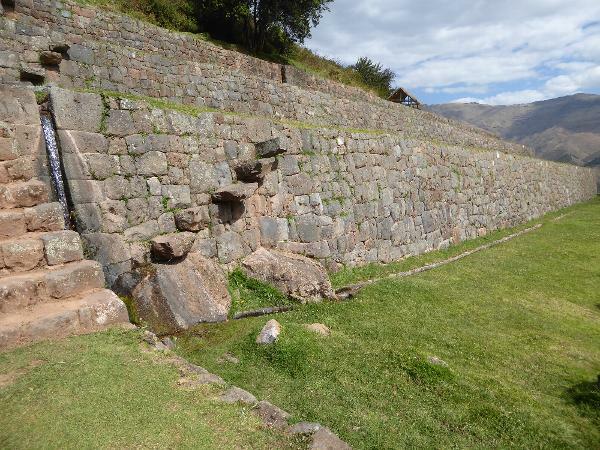 There are three parallel canals running along this southern side of the valley wall, and there's one on the other. The walls have a batter of five or six degrees. 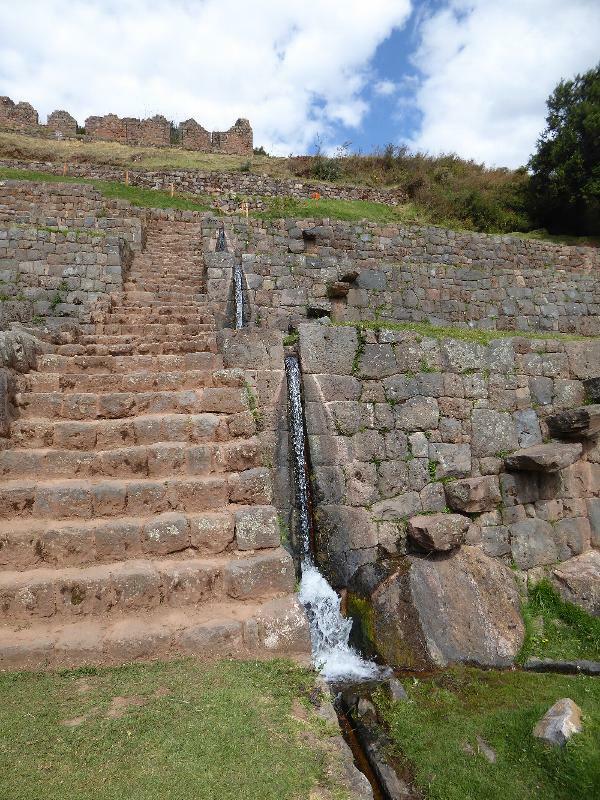 Water descends in a triple drop collecting the flow from all three longitudinal canals and bringing them to the largest of the terraces. A flying staircase for the reasonably fleet. Surplus water drops to the next terrace. 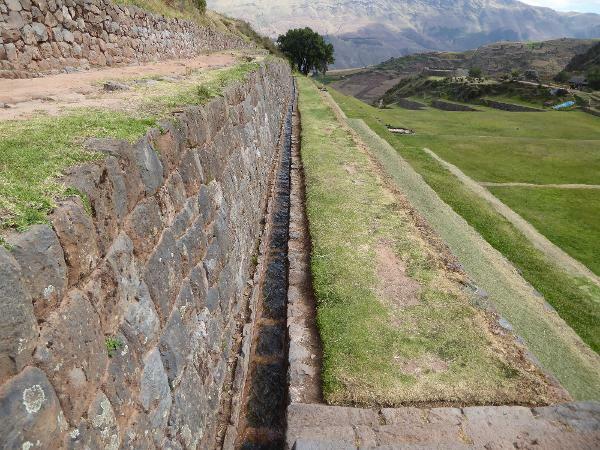 The terrace set has a slope of about 12 percent to insure that water flows from top to bottom. Nor does it run too fast: centuries after their construction, the walls have never collapsed or washed out. Like the ceremonial fountain at the head of the terrace set, the walls have been restored since about the year 2000, but they have needed no more than minor patching. 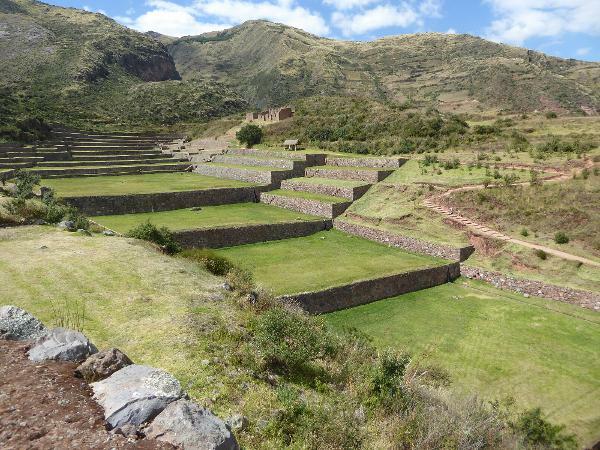 Terraces like these were not for the hoi polloi and were appreciated by Inca nobles who occasionally visited, inspected, and enjoyed perhaps not only the landscape but the sight of peasant workers. The platform here is the Sinkunakancha, a ceremonial plaza adjacent to a residential area for the nobility. Workers lived in peripheral villages. 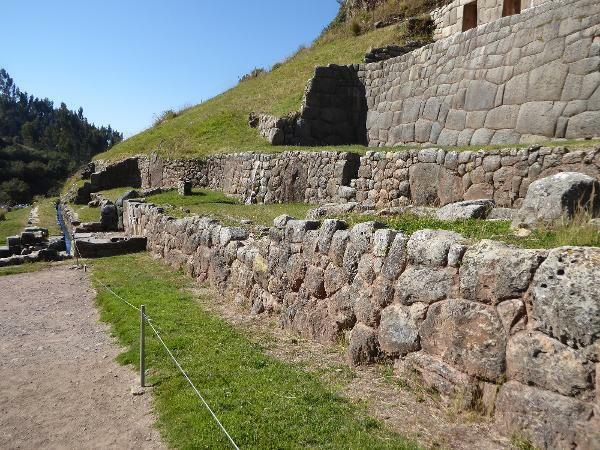 We've jumped to a spot about 25 miles northwest of Cusco. You can imagine Sergio Leone driving around and thinking how to use this place. Clint's too old, of course, and come to think of it Sergio's gone. Too bad. 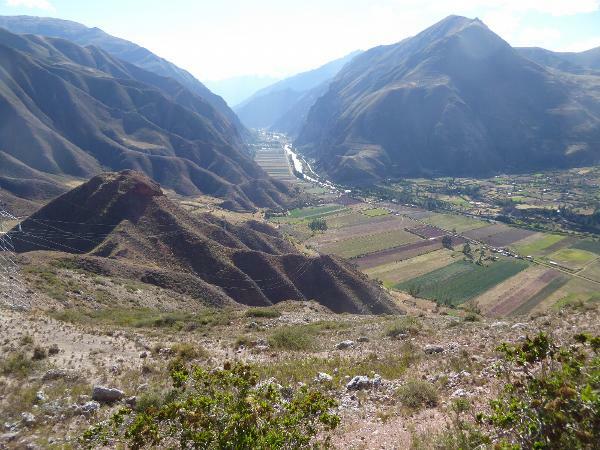 We're on a plateau overlooking the Urubamba Valley. 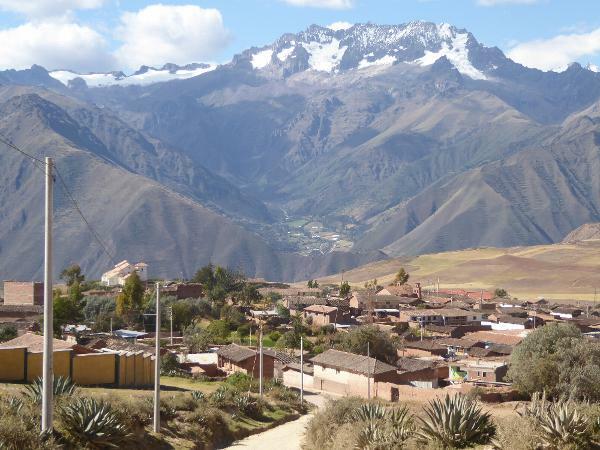 There's a town up here called Maras. The town was founded in 1556 by Don Pedro Ortiz de Orúe, a Basque cavalier born near Madrid and a companion of Pizarro. 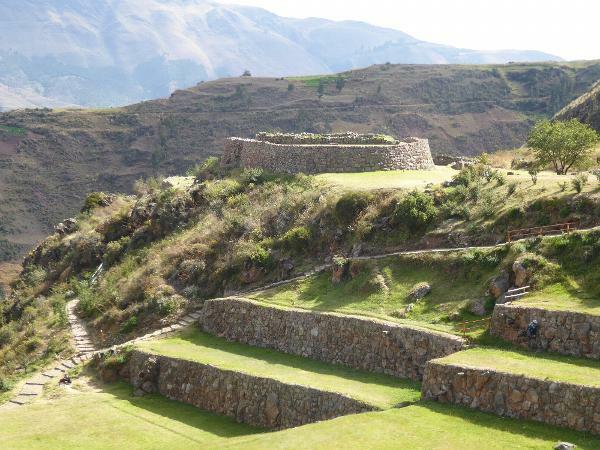 Don Pedro's title to the land came with his marriage to Doña Maria Tupac Usca, an Inca princess and the granddaughter of Manco Inca. 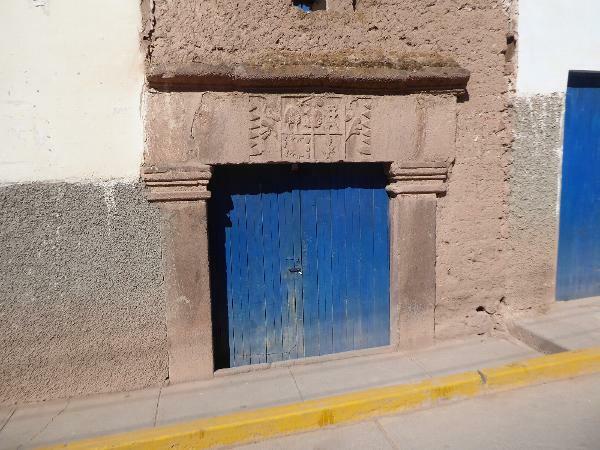 The lintel of Don Petro's house carries an image of St. Francis dressed as a Conquistador. 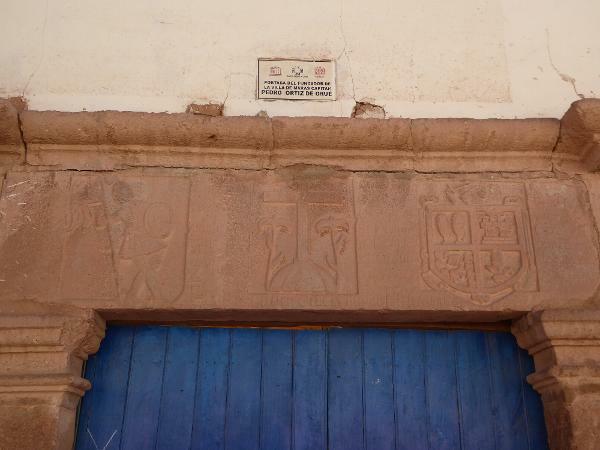 Other houses in town adopted the practice of displaying a coat-of-arms on the lintel. We've come here, however, for this. 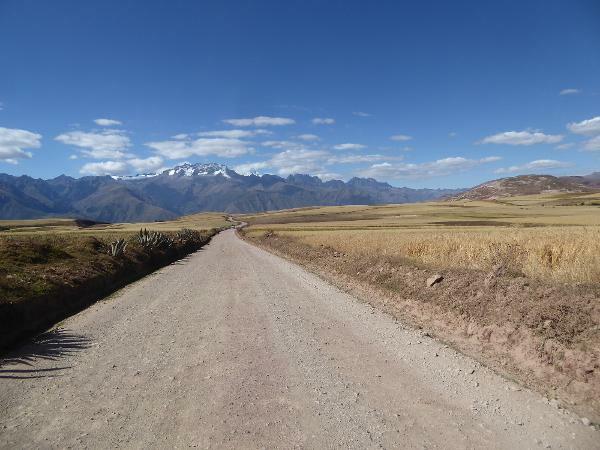 It's about three miles west of Maras. Curious, no? There are several of these circular depressions or morays. Experts nowadays call this one Sector A, and it's the largest. But what is it? Lots of visitors come, stare, and wonder. 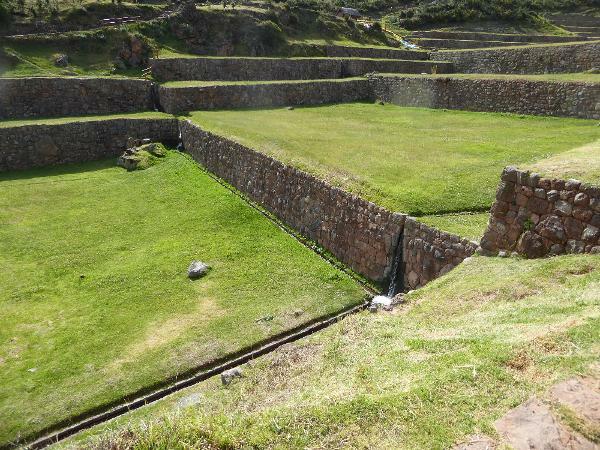 One hypothesis: the microclimate of the various terraces was different enough, thanks to shadows, for the Inca to conduct agricultural experiments. 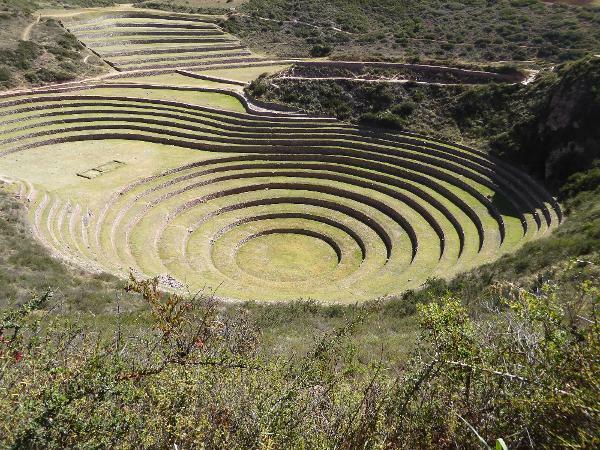 For a painstaking account of this hypothesis, see John C. Earls and Gabriela Cervantes, "Inka Cosmology in Moray: Astronomy, Agriculture, and Pilgrimage" in Izumi Shimada, ed., The Inka Empire: A Multidisdciplinary Approach, 2015. 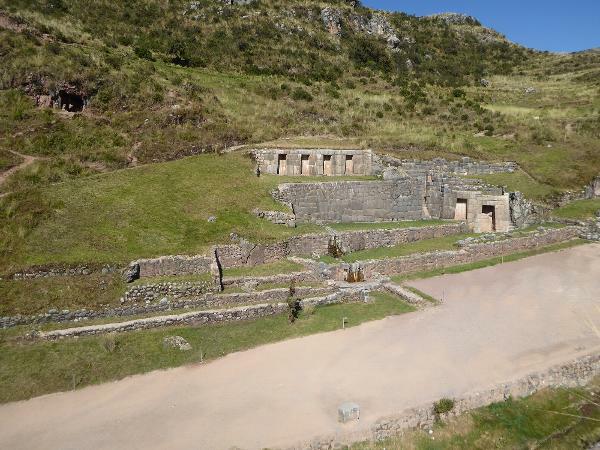 Did the Inca excavate the depression? Negative: it's a natural limestone sinkhole which they tidied up. 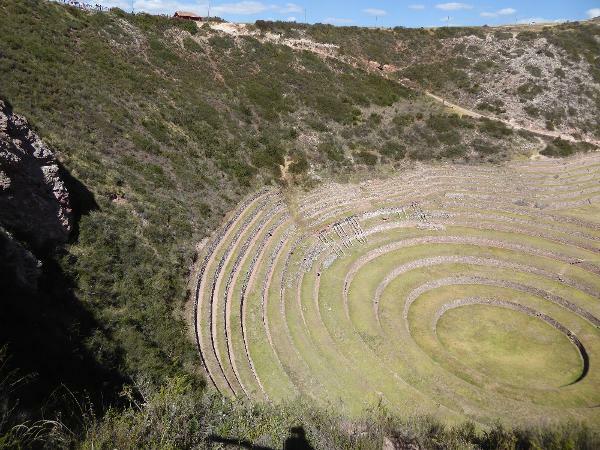 The name Moray, by the way, comes from the Quechua phrase muyu uray, meaning "down rounded." 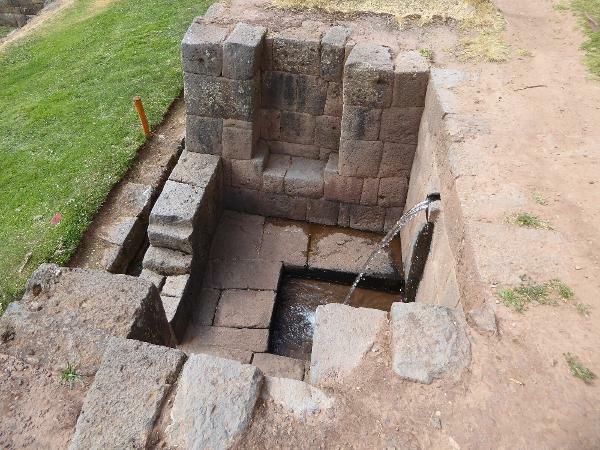 Between the elegant flying steps there's a series of irrigation drops, or paqcha. Where did the irrigation water go? Silly question: this is a sinkhole, so water naturally drains out the bottom of the hole. Sector B needs a bit more restoration. Sector C, with a fine view of Chicón.